We have a variety of AEO courses that cover achieving and maintaining AEO accreditation. Following our implementation course the delegates will understand the context and impact of AEO legislation and be able to assess the pros and cons of accreditation for their organisation as well as navigate the application process. The in-house courses will be customised dependent on your specific requirements. The courses can vary from half day to full day and are designed for those responsible for attaining AEO accreditation on behalf of their organisations which can include supply chain, customs and logistics managers, financial directors and quality control officers. The decision making process as to whether to apply for AEO, AEOC or AEOF (see our information page for more info on the different types of accreditation). The context of AEO in terms of the Union Customs Code (UCC) and on an international stage in relation to Mutual Recognition Agreements (MRA) with similar standards such as C-TPAT. How AEOS status relates to Known Consignor and Regulated Agent status. The strategic commercial benefits of becoming an AEOC & AEOS. Estimating the potential cost of the time and resources to apply and achieve accreditation including potential capex items. The AEO course is a specialist course that we run in-house at a customer’s premises only, please call to make a booking 01344 870 077. Our online course provides an introduction to AEO accreditation and meets the requirement for existing AEOs to ensure their staff have completed security awareness training. This course is ideal for those who work for an existing AEO who want to understand more about the accreditation and meet the security training requirements. 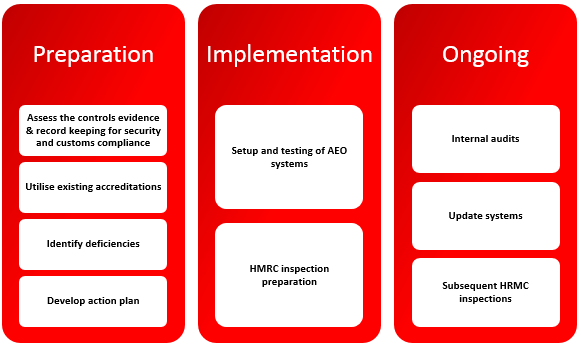 It is also useful for individuals in the early stages of learning about AEO accreditation to help assess whether AEO status would be appropriate for their organisation. To book the online course call 01344 870 077.